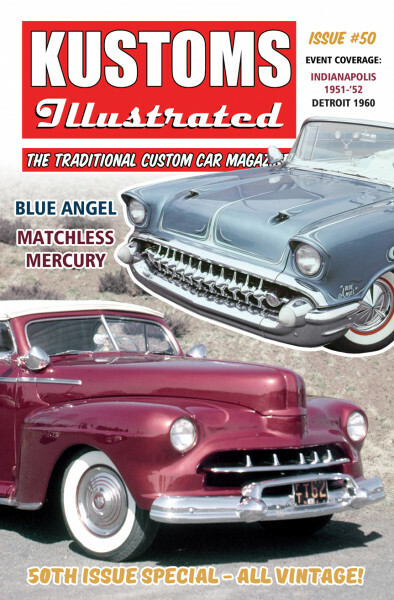 Produktinformationen "Kustoms Illustrated Issue #50"
WOW! Have we got a great issue for you! To help celebrate the 50th issue, we have nothing but vintage material between the pages. The car features, stories and even event coverage are nothing but 100% vintage. If you love kustom history, then you will not want to miss this one! I won’t spill all the beans, but you can count on four custom car features and event coverage from the Indianapolis Custom Auto Show in 1951 and ’52, (Thanks to Rik Hoving!) as well as the Detroit 1st National Champion Custom Show in 1960! Almost all of the photos have never been published or seen before and are culled from vintage high quality black and white negatives and COLOR slides! This and so much more in the new issue of the only all-kustom magazine! Weiterführende Links zu "Kustoms Illustrated Issue #50"
Kundenbewertungen für "Kustoms Illustrated Issue #50"